Banana bread is a staple at all of our houses, but we always like to sneak in a nutritional boost wherever we can. 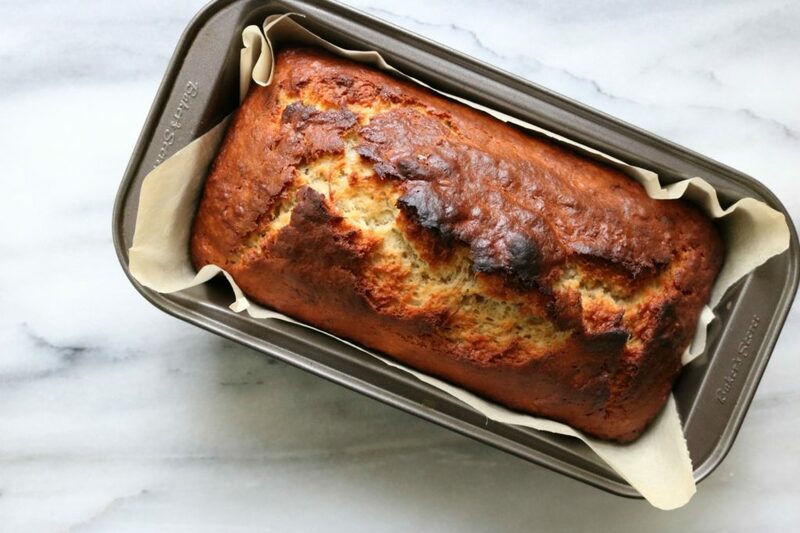 This loaf is made with overripe bananas (the ones that tumble from the freezer whenever you open the door) and barley flour – along with regular all-purpose flour, it adds a delicious nuttiness and boosts fibre even more than whole wheat flour would. You can find it alongside the other flours in the baking section of most grocery stores, and once you try it you’ll find yourself using it in pancakes, cookies, muffins, cakes – and as a bonus, it’s Canada’s third largest crop (after wheat and canola), and more than half the barley grown in Canada is right here in Alberta. In a large bowl, mash the bananas, sugar, oil, eggs and vanilla with a potato masher - don't worry about getting all the lumps out. It will look sort of cottage-cheesy. Add the flours, baking soda and salt and stir until almost combined; add any additions and stir just until blended. Spread into a buttered 8”x4” loaf pan and bake for 50 minutes, until golden and cracked on top and springy to the touch. Posted in Recipes, Breakfast & Brunch and tagged snacks, breakfast, recipes, bread.